Russia, 1891. The new governor-general of Siberia has been secreted away on a train from St. Petersburg to Moscow. 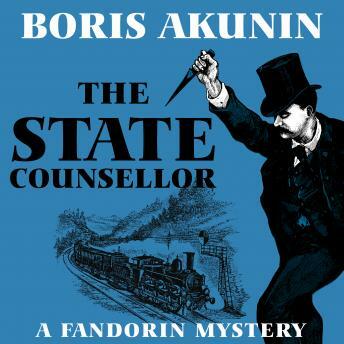 A blizzard rages outside as a mustachioed official climbs aboard near the city; with his trademark stutter, he introduces himself as State Counsellor Erast Fandorin. He then thrusts a dagger inscribed with the initials CG into the governor-general's heart and, tearing off his mustache, escapes out the carriage window. The head of the Department of Security soon shows up at the real Fandorin's door and arrests him for murder. The only way to save his reputation is to find CG-and the government mole who is feeding the group information. Can Fandorin survive corruption among his fellow officials, the fearlessness of an unknown enemy, and the advances of a sultry young nihilist with his morals intact? The State Counsellor is colorful entertainment from a master of the sly historical romp.